My very first IATEFL talk! What context do you teach in? 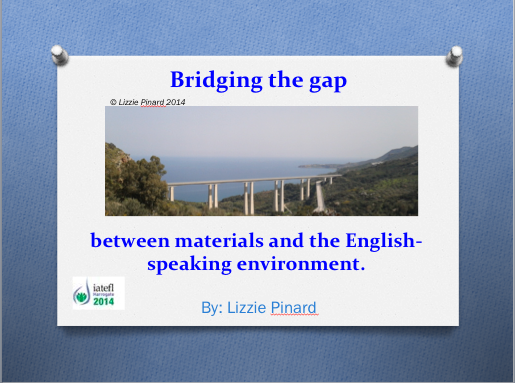 Do the materials exploit the rich resources of language outside the classroom? Do the materials encourage students to exploit it? Do materials scaffold students to exploit it? Is it a good use of so much time? Isn’t it a cop out? Mucking about instead of learning language? Pick out linguistic and cultural dynamism. Obviously the first bullet point of part 2 of the list is in keeping with TBL tenets. 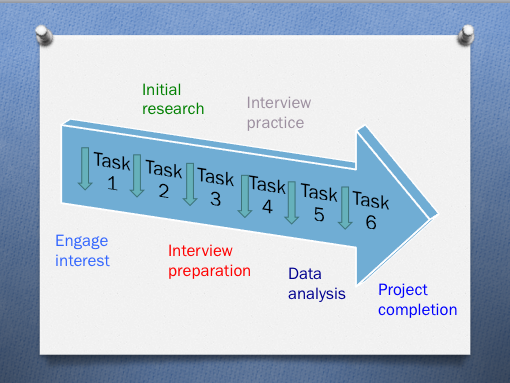 The second refers to how the tasks are going to feed into each other, how the activities within each task are going to feed into each other and how the whole is going to enable learners to be able to do something by the end of it. The third is in keeping with the Intercultural Approach and the Language Awareness approach. The final bullet point, opportunities for reflection, is crucial to all three approaches as well as being the key to turning experiences into learning, and connecting learning to experiences. 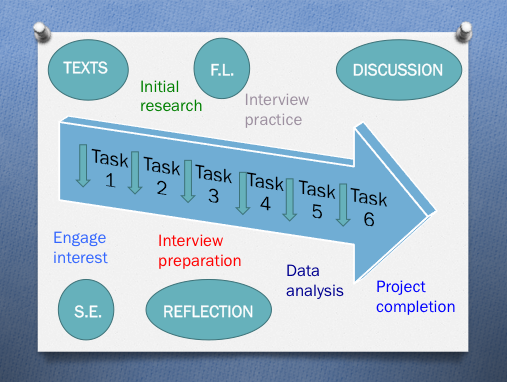 I discussed how content generated by students in the second task fed into the pre-task activity, in which students collaborate and exchange information, in preparation for the main task of this third task. 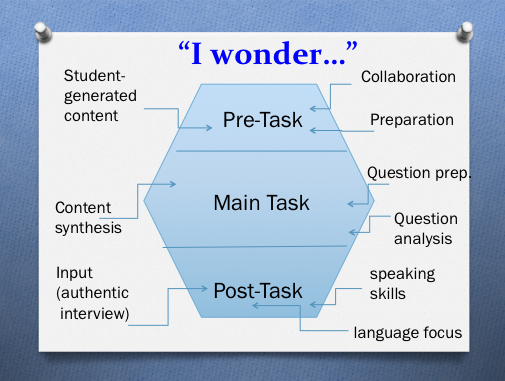 The main task requires learners to synthesise the information they’ve collected between them, and use it as the basis for their question preparation. They are then helped to analyse these questions by considering cultural and pragmatic issues, before moving on in the post-task activities to engaging with input in the form of a real interview, which leads to language focus and speaking skills development. Throughout the task, learners are encouraged to reflect and connect their own experiences and knowledge with what they are learning, and to identify similarities and differences between their own culture, other learners’ cultures and the target language culture. Being a twenty minute talk (plus ten minutes for questions), I had to bring it to an end pretty swiftly by this point, by thanking International House, Palermo, for allowing me to attend IATEFL 2014, and the Leeds Met M.A. ELT department (and especially Heather Buchanan, who was my supervisor for the dissertation project in which I made these materials) for all the guidance and support that I was given in my learning and in realising my ideas, because without the course I most definitely wouldn’t have been giving this talk today. And the final thank you, of course, to everybody who attended! Ellis, R. (2003) Task-based Language Learning and Teaching Oxford University Press Oxford. 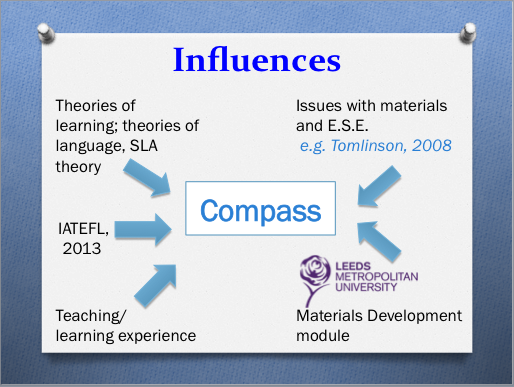 This entry was posted in Conferences, IATEFL 2014 and tagged conference, course materials, culture, intercultural communication, intercultural competence, learner autonomy, Materials, materials development, principles, skills development, theories. Bookmark the permalink.